A robotic camera in WBEZ’s newsroom allows reporters such as Rob Wildeboer, right, to appear on Chicago Tonight, the public affairs program on WTTW-TV hosted by Phil Ponce, left. When it comes to public television and radio stations working together, proximity doesn’t always equal easy collegiality. In the final installment of our Currently Curious series about radio–TV collaboration, we look at public television and radio stations that operate under separate licensees in the same market and have forged successful partnerships. Part one of the series explored national partnerships between NPR and PBS, and part two reported on work between the media within joint licensees. In Austin, Texas, a longtime editorial collaboration between KLRU-TV and KUT-FM continues to thrive, with major projects and work to repurpose a local TV show for radio broadcast. In each case, flexibility, patience and the ability to focus on the potential advantages of a partnership — and there are many — are vital to success. Yes, television and radio production approaches differ. “One newsroom doesn’t work with the same urgency as another, or even on the same schedule,” said Jim Schachter, v.p. for news at WNYC, which has also collaborated with NJTV. But all agree the advantages outweigh the problems. Collaborations allow each partner “to fulfill our mission more effectively on a bigger, broader stage,” said Schachter. In Chicago, a suggestion from a trustee who served on the boards of both WTTW and WBEZ was the catalyst for the stations’ latest cooperative effort. The stations already had a history of partnering up. Back in the 1990s they won awards for Chicago Matters, an annual series produced in collaboration with the Chicago Reporter newspaper, the city’s public library and the Chicago Community Trust. Each year the coverage focused on a specific problem confronting Chicagoans: violence, racism, aging and immigration policies. Last summer WTTW Chair James Mabie proposed working with WBEZ on a more regular basis, said Ben Calhoun, WBEZ v.p. of content and programming. “That sparked the conversation about the practical first steps to build the infrastructure to support that,” he said. A leadership change at WBEZ also gave the project a nudge, Schmidt said. Goli Sheikholeslami, who arrived as WBEZ’s c.e.o. in 2014, “is incredibly receptive to leveraging content,” he said. Sheikholeslami, whose background is in digital media, “understands that the technology enables what is really important, which is sharing content,” Schmidt said. The stations split the $50,000 cost of a robotic camera that connects the WBEZ newsroom at Navy Pier to WTTW on the city’s north side. That equipment upgrade, announced March 28, allows radio journalists to report live on Chicago Tonight during its 7 p.m. broadcast. 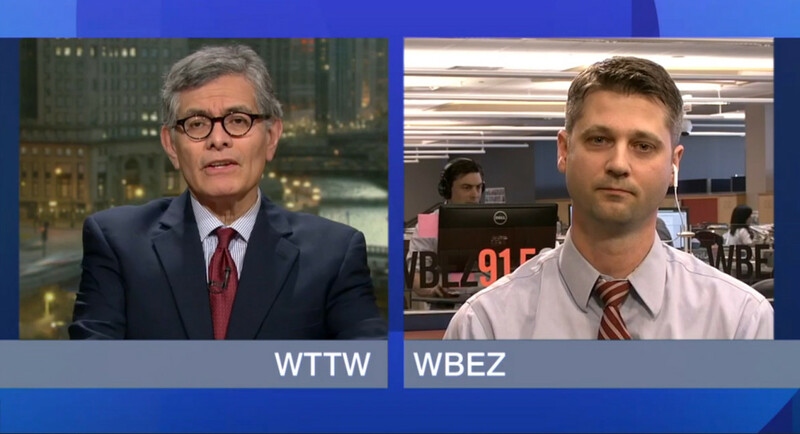 A new high-speed fiber connection also lets WTTW hosts contribute to WBEZ broadcasts. The partnership “is growing and evolving,” Schmidt said. Recently WBEZ reporters appeared on Chicago Tonight segments about sexual abuse allegations concerning former Speaker of the House Dennis Hastert and a meeting between Illinois Republican Sen. Mark Kirk and Supreme Court nominee Merrick Garland. Schmidt envisions using the link in other ways, such as for editorial planning. “We can debrief each other on our work,” he said. “It’s a no-brainer to try and find ways to get our content across more platforms to reach more people,” Schmidt said. Recently two WTTW staffers traveled in person to WBEZ “just to give a training session to our reporters about being on TV,” Calhoun said. The public media news landscape in New York City is similar to other major markets: The radio newsroom at WNYC has “heavily invested in reporting,” Schachter said, while WNET, the flagship public television station, has experienced producers but far fewer journalists. One of those conversations has now progressed to a joint reporting proposal. WNYC’s On The Media and WNET’s NewsHour Weekend teams could soon join forces to examine issues related to poverty and how newsrooms cover it, Schachter said. Early plans include sending On The Media host Brooke Gladstone to report from the Republican National Convention in Cleveland this summer about how poverty affects the city and how local news organizations report on it. “We hope those reports will land with some impact during the presidential campaign season,” Schachter said. WNYC also took part last year in a “multi-newsroom, multipronged project” that examined the toxic environmental legacy of New Jersey, Schachter said, called “Dirty Little Secrets.” The Center for Investigative Reporting and the Center for Cooperative Media at Montclair State University coordinated reporting among nine news entities, including NJTV and dual licensee WHYY in Philadelphia. “In addition to contributing investigative reporting, we brought NJTV reporters on our air,” Schachter said. WNYC reporter Sarah Gonzalez also appeared on NJTV News with Mary Alice Williams, a weeknight series that airs at 6, 7:30 and 11 p.m. on NJTV, operated by WNET. Cooperation between KLRU-TV and KUT-FM began decades ago when the two were housed on the same floor in a building at the University of Texas at Austin. Back then, joint projects took root as staffers ran across each other and pitched ideas. Over the years the stations have reported projects and co-produced mayoral debates, forums on transportation issues and Civic Summits, town hall–style discussions on public affairs. And the shared work hasn’t slowed down a bit. Their most recent collaboration last year, with the local Austin Monitor newspaper, was “Austin’s Eastern Frontier,” a digital reporting project investigating the impact of explosive growth in the metro area. Stories focused on the city of Manor, 12 miles northeast of Austin, where the population has mushroomed more than 500 percent over 10 years. They chose to report during the summer months, traditionally a slow news time, and publish in the fall. KUT took on radio and web work, KLRU produced video and the Monitor contributed text. Pieces delved into topics such as education, transportation, food and healthcare. The stations are also currently working on bringing TV programming to a wider radio audience. KUT airs an audio version of Overheard with Evan Smith, a KLRU public affairs interview program hosted by the Texas Tribune c.e.o. The stations have started working together to improve its repackaging for radio and expand its distribution, according to Sara Robertson, v.p. of production and technology at KLRU. Next up, said Emily Donahue of KUT, is a joint project this summer to mark the 50th anniversary of the 1966 UT Tower shootings, America’s first mass murder on a college campus. The partners will create content and sponsor public events recalling the event and exploring current gun control issues. “Together, we produce something more powerful,” Donahue said. Currently Curious: Why isn’t there more collaboration between TV and radio? Corrections: A previous version of this post reported that KLRU’s Overheard with Evan Smith was being reformatted to air on KUT. The program already airs on the station. A previous version also misstated that the Center for Investigative Reporting is part of Montclair State University. CIR is separate from the school.